When planning for this trip, I had to be strategic with the amount of swimming I could watch with my two children, ages 9 & 6. In their young minds, they are at ‘another swim meet’ with mom & dad. 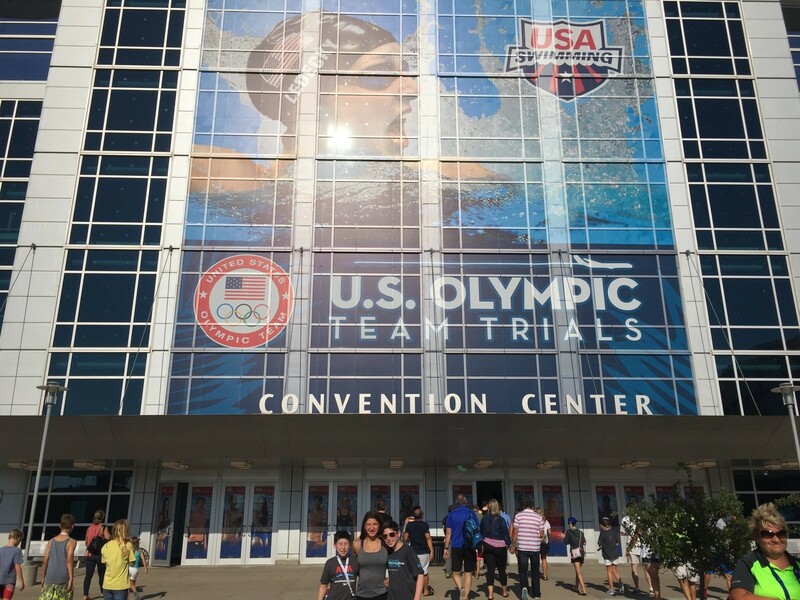 The schedule for prelims was favorable: women’s 50 free and Men’s 1500. We awoke early enough to head to the lobby for a quick breakfast, and as kids do, they raced to the elevator, the doors opened and they charge in almost gut punching Jack Baurle. “Sorry coach!” is all I can say. He grins, full well understanding child-like hotel excitement. Entering the arena, we locate our seats. The athletes for the first heat of women’s 50m free are being announced. My daughter quizzically looks at me, “where’s the music? The light show? 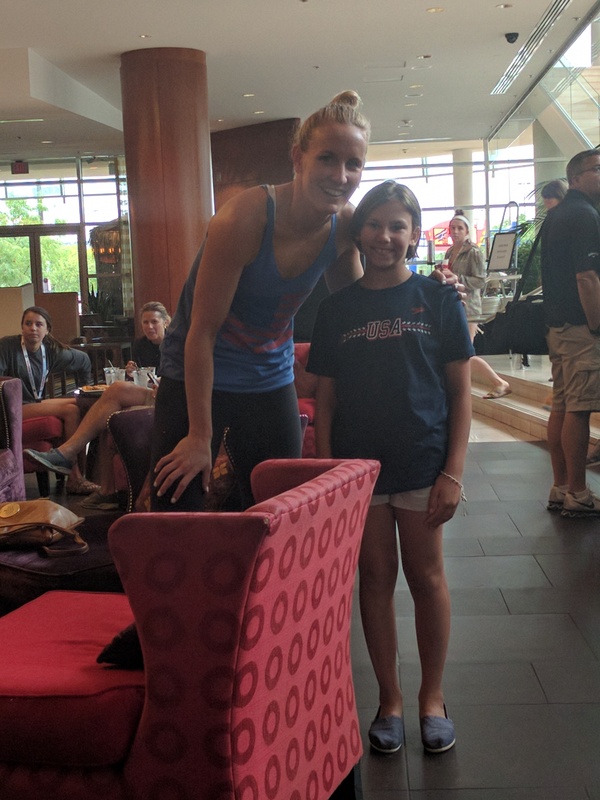 !” I do my best to explain to a 9 year who hasn’t attended any ‘big’ meets yet the difference between morning and evening sessions, but the first heat flies by with two women under 26 seconds! Heat by heat they speed through, 18 in all. We watch former Olympians and newcomers splashing and dashing their way down the pool. In a flash, the prelims of the women’s 50 free is over. 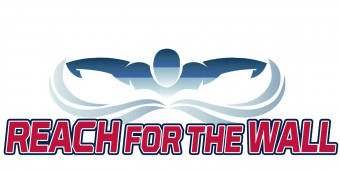 The top 16 swims are posted and I nudge my wife; Jessica Hardy is in 24th place. Amongst a few other favorites, we were really rooting for her. As former swimmers, we suddenly realize what that result means for Jessica. The first heat of the men’s 1500 goes off and the kids turn and ask, “AquaZone, now?” Yes, we can go to the AquaZone now. There are 10 heats of the 1500 and television screens throughout the arena so I knew I could catch the circle seeded heats as the kids did the activities, so off we went! 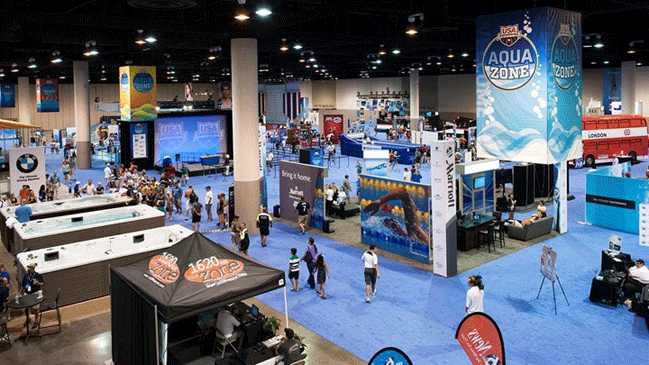 The AquaZone was set up in the convention hall adjacent to the arena. Entering the doors to the left you look out upon a sea of interactive activities for young and old, to the right is retail, retail, retail!, and suspended from the ceiling is a huge American flag constructed out of lane lines! Awesome. We hit the retail and then as many AquaZone events the kids could muster before they start whining for food. Thankfully the lobby restaurant wasn’t too busy and we found a table near the bar area. About halfway through eating, the kids are getting restless again. Go figure. We notice the table next to us toasting champagne. Our daughter asks who they are. By now she’s a pro at spotting swimming royalty. It took only a second to realize it is the Hardy family. They were a large group of beautiful people enjoying each other along with some Veuve Clicquot Brut. We witness a little girl prance over to Jessica to get an autograph on her American flag kickboard. Jessica signs with a smile. The parent in me suddenly gets emotional. This is a personal moment in the Hardy family, but Jessica shows so much class and makes that little swimmer’s day. Watching that scene play out, my daughter jumps up begging us if she can ask for an autograph as well. Normally I would never interrupt such a family gathering, but it was clear Jessica didn’t mind. She was so gracious. We snap a quick photo, tell Jessica how much we’ve rooted for her over the years, and wish her well. Later in the day, she confirmed through social media her 50 free that Saturday morning was her last race. Congratulations, Jessica. I’m so proud my daughter looks up to an athlete like you. Remember in yesterday’s article I mentioned we would need naps? Well it happened. The family went up to the room while I stayed behind to pick up a few more souvenirs. 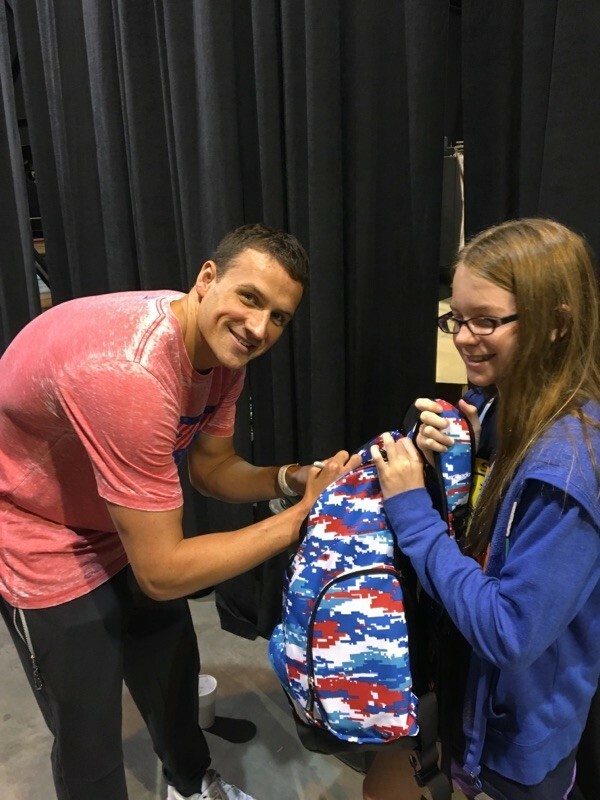 Suddenly I get a text, “Lochte is in the lobby, get down here!” I hustle down to see Ryan flanked by 15-20 kids (I’m calling them lil’ swim groupies) getting him to sign their clothes and take selfies. Lochte’s phone rings; he meets up with a guy behind him, grabs a bag of Jimmy John subs and off he goes thanking the lil’ groupies. I think to myself, I better go grab a work out. Turns out my daughter wants pool time as well. Workouts and showers complete, it’s time to get psyched for finals. We invited friends to tonight’s session and are meeting them in the bar area of the Hilton. The lounge is buzzing in anticipation for tonight’s session – 4 finals and one semifinal. We hang back a bit at the bar and one of us spots a guy 6’8” chatting with a group of friends. That’s Biondi! Inching closer to his group, we take turns recalling our anecdotes of the epic battles he had with the Russian rocket, Michael Gross and Jaeger. We were waiting for an opening to politely interrupt. Afraid it wouldn’t happen, we decided to take a picture with the back of his head in the background. Honestly, that was all I needed!! But a woman from his group clearly amused seeing our efforts, tapped him on the shoulder. He turned and was very gracious. Yup! I’m still a fanboy! On cloud nine, we skip off like 12 year olds to the arena not fully comprehending what just happened and what we are about to witness in the pool. The light show and music are pumping once again. My daughter makes eye contact with me right away. I nod in agreement. 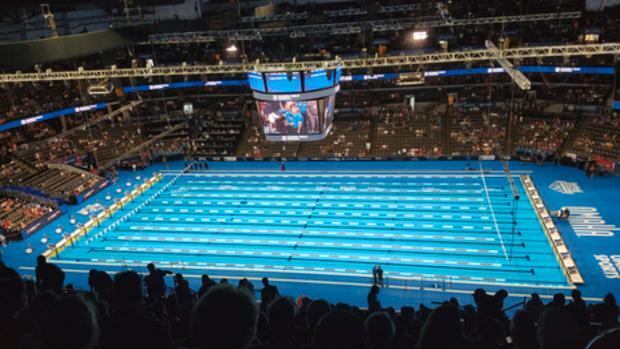 We are about to experience one of the most amazing nights in swimming history. The night kicked off with the women’s 200 backstroke. Maya DiRado and Missy Franklin battled, but that night DiRado was quickest to the wall. Also in the heat was 2012 bronze medalist Elizabeth Beisel, another favorite of ours, who likely swam her last race on US soil. We witness a lot of last races tonight as exhilaration and adrenaline wash over us with each event. Next up is the Men’s 100 butterfly. Total crap shoot on who will win, but the whole arena is hopping. 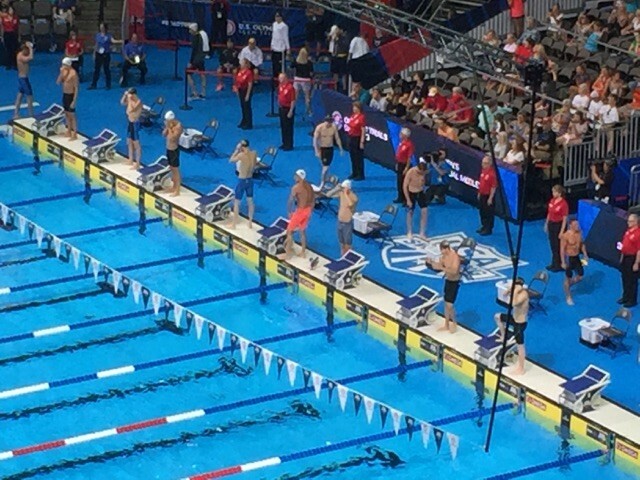 Phelps, in lane 7 is 4th at the wall at the 50m turn. For a moment the thought creeps in ‘does he still have it?’ He blasts the turn and edges ahead of the field with his trademark streamline. It’s down to Phelps and Tom Shields with about 10 meters to go! The touch… Phelps! When I tell you the crowd was roaring, I don’t think that fully describes the awesome sound. Then, over the loudspeaker we hear, “You have just seen Michael’s last race in the US!” Nothing can explain the energy in the building. Up next the women’s 800 free with Katie Ledecky. No doubt that she will win this one, but I want to soak this in. Though we don’t live far from Ledecky, we have never witnessed her swim in person until this weekend. She blasts off the blocks and goes out hard. At the 200 she’s almost 2 seconds under world record pace! The announcer simply states, “C’mon Omaha – you know what to do!” The crowd goes from a murmur to a roar through the 600 mark. She’s slowed a bit and her splits are showing we won’t see a record. But still! She’s leading the field by 10 seconds! Another commanding performance and the crowd shows their appreciation, if not awe at her performance. lowers, water fountains laced with fire spout from the floor and slowly the platform raises holding Phelps and Shields. Ian Crocker is the guest presenter and he provides a warm hug to both athletes. 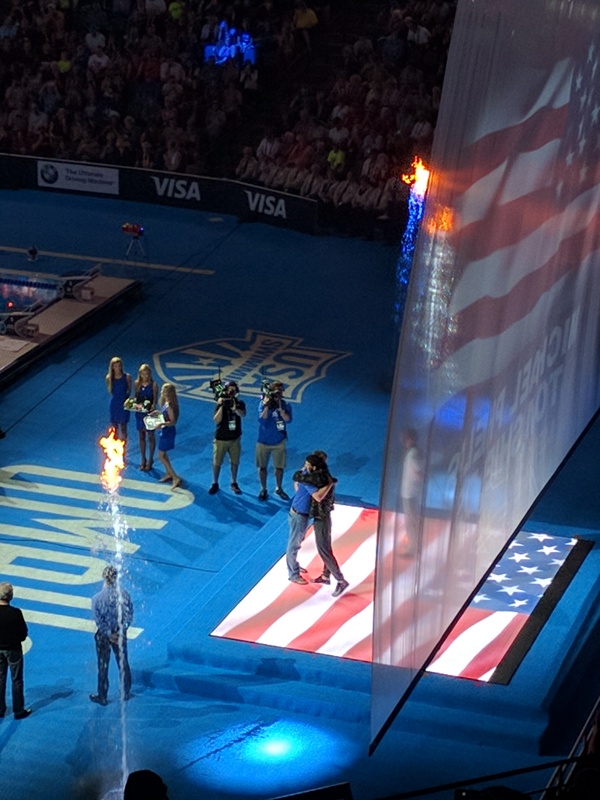 US Swimming and event organizers have done a phenomenal job to make things enjoyable, even the medal ceremony! Next up, the Men’s 50 freestyle. The heat is split with veterans and newcomers. In the end, Nathan Adrian and Anthony Ervin are separated by a hundredth of a second to steal first and second place, securing the event in Rio. Awe man, Cullen Jones finds the unenviable 3rd place. Side note, my wife loves Jones, as an athlete and for all his efforts through USA Swimming’s Make A Splash Foundation. If you aren’t aware, Cullen Jones almost drowned at a water park when he was 5 years old. After that incident, his mother immediately put him in swim lessons. He’s currently an ambassador for Make A Splash and works to promote water safety and reduce risks of drowning. We may have seen his last race as well. The culminating race of the night is the women’s 50m free semifinals. All the ‘big names’ make it back for the final, with Weitzeil leading the way. We know the drill. We hustle out of the arena to get to the skywalk. As we make it up the escalator, there’s a small crowd around newcomer Jack Conger, another local favorite of ours who secured a spot for Rio Tuesday night in the 200 free placing 3rd and was 4th in the 100 fly tonight. I get a few pictures with the kids and offered congratulations. We get to the skywalk and see a beaming Cierra Runge decked in her Wisconsin tank. She was just confirmed on the team for her 5th place performance in the 200m free. Kids are asking questions, some not quite sure who they’re seeing. Directly in front of us, still beaming she answers one dad, “I’m 6’4!” I glance at the far wall and see her family huddled; mom is in joyful tears. Her daughter is an Olympian! Cierra breaks away from the kids and jumps into mom’s embrace. Buzzing from all the activities the past day and a half, we plop into bed. Thanks, Omaha for providing such an accessible and entertaining venue. Our experience surpassed all expectations. Our children are now filled with hope for a return trip! Perhaps I can write from another perspective in 2024?